Coarse and course, are a pair of homonyms in English which have exactly similar pronunciation, but their spellings and meanings are contrasting. The word coarse means something that is harsh or rough in nature. But on the other hand, the word course has to do something with progress, it denotes a path that leads to upward movement or the way of doing something. Let’s take a look at the examples below which will help you to understand the difference between these two. Joe’s teacher advised him to join a personality development course, as he often uses coarse language in the class. As the sand of the course is coarse, one of the runners fell. 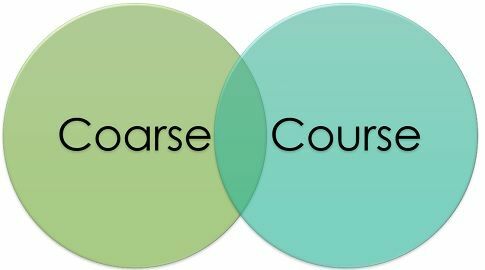 In the first example, the word ‘course’ is used with respect to a programme, while ‘coarse’ means rude or abusive here. In our next example, ‘course’ is used to mean the sports arena, while ‘coarse’ means rough and uneven. Meaning Coarse refers to a material which is rough, uneven, impure, cheap or poor in quality. Course implies the route or path, over which something passes or proceeds towards the goal. Example Use of coarse language is strictly prohibited in the school. This is the best race course across the continent. The employee is reduced for his coarse behavior at the office. What course of action, should be taken to avoid continuous losses? She is having a coarse sand paper. We have ordered noodles and pizza for the main course. You have very coarse hair. He is wearing a linen shirt, which is a very coarse-grained cloth. Joe often uses coarse language while talking, that’s why I don’t like him. Why don’t you change your coarse behaviour? I have joined a summer course next week. Kate has completed her CA course, last year. As the course was damaged due to heavy rains, the match was cancelled. Rules are the course of action that guides a person what to do in a particular situation. In the course of the examination, Peter realized that he is not the deserving candidate for that post. The aircrafts followed the same course. After getting the news of cyclone, the captain immediately changed the course. The couple arranged a three-course lunch for the guests. The main-course served at the party was mouth-watering. A recent trend of feminism is coursing among women. As the bottle fell, water is coursing through it. Coarse is used to denote something which is not fine, even, delicate or is very low in quality. On the other hand, course means route or path which a ship or aircraft follows. It denotes the way in which something evolves gradually. As the word coarse describes the quality of a noun, it is an adjective, which implies scratchy, unrefined, indecent, etc. On the other hand, the course is mainly used as a noun, to mean path, direction, or a set of educational classes. It can also be used as a verb to mean to move/flow swiftly. Police arrested the accused of using coarse language for his wife. The dress is made up of coarse fabric. In this project, the students have to make something unique out of coarse material. The strategy is the best course of action, to reach the desired end. Lily wants to join a cooking course. In the course of the battle, the king lost his life. We are quite aware of the fact that the words coarse and course produce a similar sound, but they are completely different in terms of meaning. Coarse is used to denote something rough, impure, cheap or ill-quality material, but the course has several meanings, but they all revolve around route or an upward movement, to proceed from one point to another.